Morning. 10am. Alarm from my cell phone was ringing some "you should wake up" melody. I saw Maria awaken already. She was on her net book, working on something. "When did u woke up?" I asked. "Just now" She said. It was fresh outside and we could feel humidity. 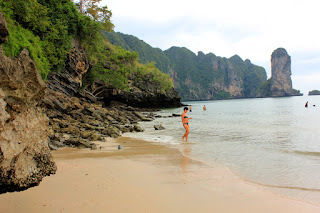 Our plan was to go to the coast, Ao Nang beach 20km from Krabi town. We packed quickly, checked out and in a 5minutes we jumped in to the mini bus that was going straight to the Ao Nang beach for 50baths. We were traveling less then 25minutes with one middle age Swedish coupe, two girls from Ukraine and one Spanish guy who did not know English well but it was also funny hehe..
On the way to our next stop I was thinking if we gonna find some budget guest house since it is high season. We were lucky. Nice and clean room in "Jinga" guest house for 300baths per night was really good choice. Plus the beach is near. We spend the day looking for a daily excursions for Phi Phi island, some James Bond as well and also we booked "4 islands boat trip". The whole trip package has reasonable price so we decided to stay in Krabi for a next five days. I remembered my friend Dana told me once that Thai food is very spicy but we did not shared the same experience... Until now.. We took some "Tam Yam" soup at the local street restaurant (if I can call it like that) and we also said that we wont any hot spices but... it was very, very spicy. We ordered rice as well. The guy who was sitting at the table next to us said that we should not eat all the contains of the soup because they are using them just for a flavor. We ate as much as we could and decided that was enough. When the bill came, we were shocked. It was like 9 dollars for the soup. Can not say it is cheap for the street. We were still hungry but I want to keep maria in a shape :)) If you want to take a local soup go to a restaurant.